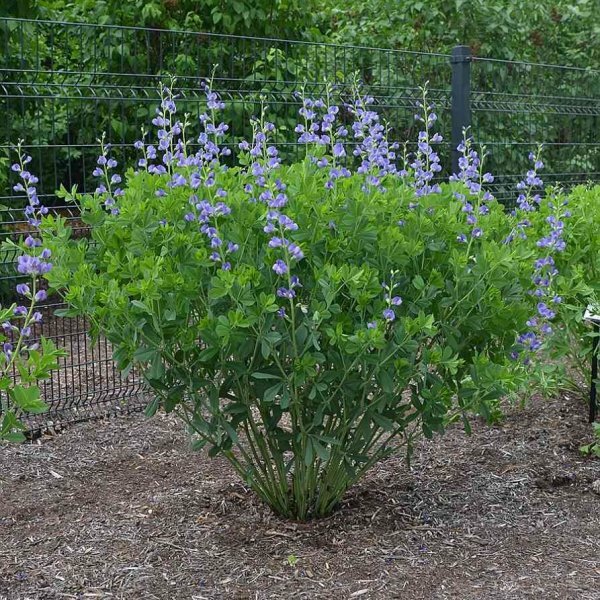 When looking upon a mature false indigo in bloom it looks much like a small shrub, but it’s truly an herbaceous perennial, meaning it dies back to the ground each year. 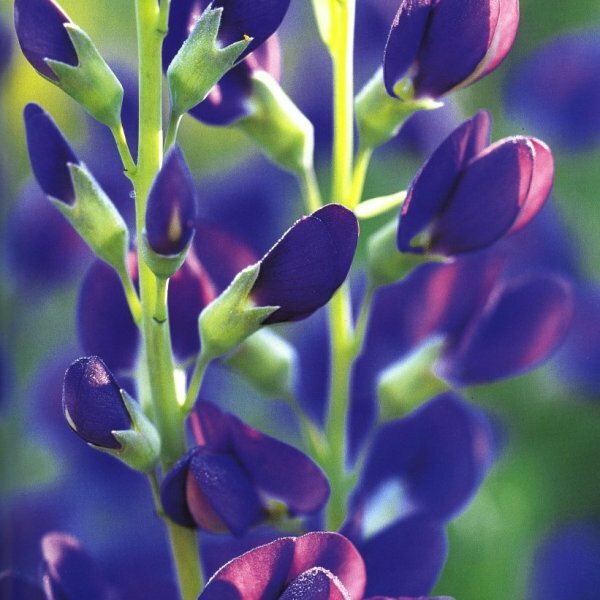 Native populations of false indigo exist across a large part of eastern North America, in all but a few of the most southern states. They tend to grow in old-fields, prairies and other open wild areas. 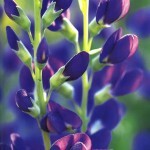 Some Native American tribes used Baptisia roots for medicine and the flowers or flowering stems for the dye they yield. 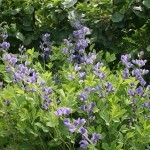 Despite the common name, false indigo dye is not blue but shades of orange, brown and olive green. Trifoliate, compound leaves of gray-green cover upright stems that rise from the ground in spring. As plants age, they develop more stems and become broader and bushier. 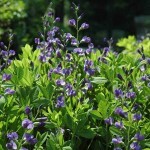 In late spring to early summer, spikes of violet blue, sweetpea-like flowers appear. These are like manna to bees, particularly queen bumblebees. Hummingbirds have been known to occasionally visit the blooms of false indigo but the flowers have the incorrect floral formula for butterfly pollination. By midsummer, lots of bulbous green pods are produced. These turn black as they age and are visually interesting. They can even be cut for dried floral arrangements. 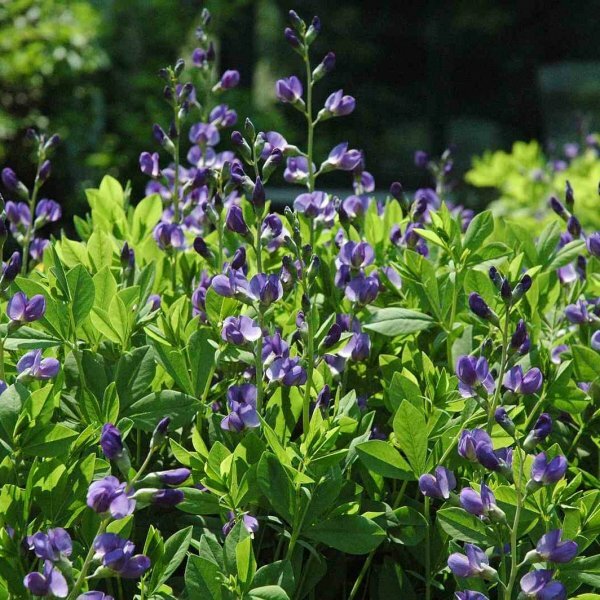 False indigo grows best in full sun and fertile loam but also thrives in poorer sandy or gravelly soils. Excellent soil drainage is a must. It forms a very deep taproot and does not take well to transplanting once established. 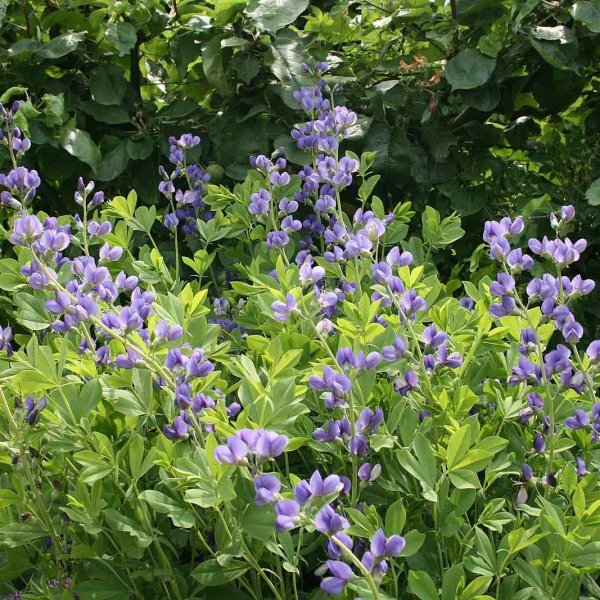 False indigo is a very hardy plant that can withstand deep, freezing temperatures. 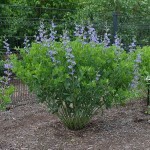 It has few pest and disease problems if grown under the right cultural conditions. Plants will self-sow. Seedlings are slow-growing and take three to four years of growth before they will flower. Transplant them in the first year if they are to be saved. Germination 1. Soak the seeds in a jar of warm water for 24 hours to soften the seed coat. 2. Nick the seed coat with a sharp knife. This makes germination easier and faster. 3. Fill the peat pots to 3/4 inch below the rim with seed starting mix. 4. Place the seeds on top of the mix and cover them with about 1/4 inch of mix. 5. Set the peat pots in the tray and thoroughly moisten both soil and pots with water. Allow the pots to drain for a few minutes then dump any remaining water from the tray. Never allow the pots to stand in water. 6. Slide the tray of peat pots into a plastic bag and secure the opening with a twist tie. Set the peat pots in a 70 to 75 degree Fahrenheit area out of direct sunlight to germinate. 7. Check daily to see if seedlings have sprouted. Germination takes five to 36 days. Once the seeds germinate, remove the tray of pots from the plastic bag and set them in a sunny, south-facing window. 8. Keep the pots moist but not dripping wet. Watering once a week is usually sufficient. 9. Use one-quarter strength water-soluble fertilizer to water the plants no more than once a week. 10. Transplant seedlings outdoors after the last frost.